No-one could save Woolworths, because the niche it had catered for no longer existed. Similarly, commentators are up in arms about the plight of regional newspapers. But when was the last time you read one? Sometimes, the depressing conclusion is the only accurate one. There's a simple reason the newspaper business is in trouble: No one is buying newspapers anymore. You aren't. I'm not. As a result, newspapers are in a death spiral of sorts - they start raising their prices, which makes even fewer readers want to buy them. Offering free Internet versions of newspapers is one competitor. Another is pure Internet news aggregation and free sites. But there's more to this story, and less. Cruel, yes. But also true. The real problem with the newspaper business is that newspapers did not really understand their business. Most newspapers derive a majority of their revenue from advertising - classified (user-generated ads, if you will) and paid advertising. In effect, they are advertising delivery vehicles that happen to have news. Once Craigslist, Ebay, Freecycle, HotJobs, Monster, and other special-purpose sites ate the newspapers primary classified businesses, the newspapers started dying. Newspapers hadn't realized their "true business" was conveying classified ads. 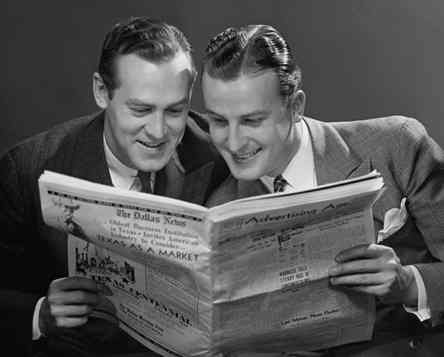 If their business really was news, papers would be competing and succeeding on the quality and quantity of news. Newspapers that delivered true, accurate, and well-written news - or at least popular news - should thrive. While people can argue about the quality of news reporting over the last few years, it is difficult to argue that a general decline in quality is responsible for people abandoning the newspapers for Internet and TV news, as those providers offer even lower quality, less reliable news. That's not why revenues and readership are declining. Ultimately, the regional (and some national) newspapers are dying because people just don't care about them. No readers, no purchases, no paper. They're less relevant to readers because there's better ways to get news (TV, Internet) since the key value for news to users is timeliness. They're less relevant to advertisers because their targets are elsewhere now. The National Association of Record Merchants (NARM) is now sponsoring "National Record Store Day", as sure a sign of the irrelevance and death of the record store as there is. It was April 18, 2009 this year. Why aren't we going there anymore? There are parallels with the newspaper situation. Record stores died because they didn't really understand the value in their business. Record stores assumed there was something "magical" about the record store experience. But really, record stores only existed because people needed a place to go buy music. The only reason we went was to get music. Once we could get it someplace else, we stopped going. Once Wal-Mart, Best Buy, and Target started carrying the Top 100, 40, 20, or 10 (and deeply discounting those records as loss-leaders to generate store traffic), record stores began to lose their walk-in traffic from casual fans who wanted one record and would pick up a few others as impulse buys. Once Amazon and other web sites were able to offer catalog depth far exceeding even the largest megastore, record stores began to lose their hard-core traffic. I remember trying to buy a Kraftwerk record in the late 90s at the Virgin Megastore on Sunset Boulevard. I was told by one of these employees they could "special order" it for me. It would cost extra and take 2-3 weeks to arrive. I went home, ordered it on Amazon, and it showed up days later, on my doorstep. No extra charge. Unsurprisingly, that Virgin Megastore is now shuttered. Of course, not all record stores are gone, just like not all newspapers are gone. But the ones that remain are the same kind of small, niche-oriented, small sub-culture shops that exist for just about any hobby, such as comic-book collecting. And just like some people enjoy the ritual or habit of reading the Sunday paper (partially because it's old fashion, tradition, etc.) there are people who enjoy browsing and wandering through record stores. But record stores, like newspapers, are irrelevant to the majority. They're no longer a cultural force, and like newspapers, ultimately only have themselves to blame. More forward-thinking stores would have understood they were in the music distribution business. There was no reason for Amazon to be able to destroy Tower et. al. except those stores couldn't see beyond their expensive real estate. They thought their stores, employees, and fancy displays were the "magic" driving their business. All the customers saw that as the packaging around what they really wanted - the music. Once they could get the music in more convenient ways, they didn't need the record store or even the compact disc anymore. In February of 2009, reports began to crop up that The Tonga Room was going to be closed and likely demolished as part of a condominium conversion of the building it inhabits. Once the word was out, a few people started a belated attempt to save it. But it's too late. By the time you have to organize an effort to save something - National Record Store Day, for example - it's already too late. Predictably, the San Francisco whiners come out in droves in comment sections on websites, bemoaning the loss of another San Francisco icon, griping about dot-com carpetbaggers, and saying that San Francisco just isn't what it used to be. They should go look in the mirror. The Tonga Room is closing, just like newspapers and record stores, because you don't go there. I don't go there. They don't go there. If it had fantastic business, it wouldn't be closing. End of story. You can get the historical society to label it a landmark. And then just like all the other landmarks, you can museumize it. Charge a fee. Trap it in amber. Restore it to its former glory, just like it was decades ago. Tourists will stop by and check it out on the way to Coit Tower. But you won't go there. You'll sit at home, reading the news on your iPhone while you listen to the music you downloaded from the Internet. You'll sip your coffee, look out the window, and wish you lived in a simpler, better, time - one filled with newspapers and record stores and charming Tiki bars. You might even wonder why people don't appreciate what they have until it's gone. "Overcast" books are now available from Blurb in both ImageWrap hardcover and softcover. You can see Blurb's preview and order your copy today. Created to accompany the 2009 album "Overcast", the book features more than two dozen images by noted photographer James Carrière and book design by award-winning designer Iran Narges. "Overcast" includes the complete lyrics for the songs as well as essays and blog entries by Anu describing the creative process, completed entirely during February 2009. The "Overcast" book is the ideal companion to the album and a beautiful art piece on its own. It is clearly the best of the books I've done so far. There is also a free PDF available with the album or by itself. Gary Louis Finneran took his own life on May 10, 2009. He was 45 years old. 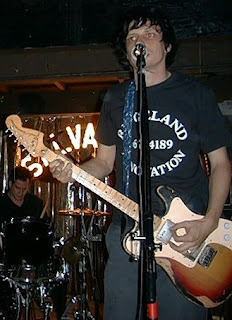 Gary was best-known as the singer for the Ex-Idols, a notorious Los Angeles/Orange County punk band active in the early 1990s. I knew him as the leader of Tuscaurora, a loud-as-hell rock band in the late 90s. 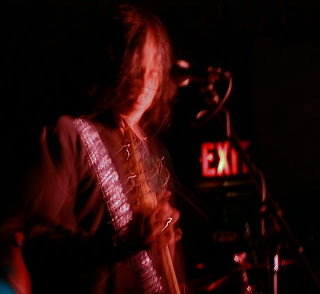 Gary wrote terrific, creative songs, sang with a unique voice, and played left-handed guitar. As musicians go, Gary was the real deal. Gary was a charismatic, talented, and troubled person. He had an infectious smile and true punk's sense of fun, adventure, and a lust for chaos. Whenever I think of him, I think of him smiling or laughing. I didn't know him well, but well enough. Well enough to know how much he loved and idolized Kurt Cobain. How passionate he was about music. And drinking. I spent time with his kids. I saw his bands play. I saw Gary set fire to a stage. My then-girlfriend Anne was the bass player for Tuscaurora and the keyboard player for the M-80s, an 80s cover band who were one of the inspirations for Sid Luscious and The Pants. I reconnected with Gary briefly a few years ago. At that time, Gary was taking composition classes, "learning to write real music", he said. It sounded like he had moved beyond his self-destructive tendencies and achieved a new kind of happiness and stability in his life. I am sure Gary's better friends are feeling the same way I am about him these days: Surprised. Not surprised. Disappointed. Angry. Sad. Mystified. Grateful that we had him as long as we did. In addition to his music and devastated friends, he leaves behind 3 children. The world is the poorer for his decision to quit its stage. The Ex-Idols have made their music available for free download. "He took it all too far, but boy could he play guitar"